Hello, my name is Rhys McKenna, I’m from Stirling in Scotland, having completed both MFA Fashion and BA(Hons) 1st Class Fashion degrees at Edinburgh University. As a practicing freelance designer a determined curiosity to constantly learn and absorb new knowledge to fuse with my own practice is what drives me. I have enthusiasm and ambition to take up all potential creative opportunities, ad-hoc special projects and research-led design experimental work. Through MFA study and parallel work trajectories my investigation focused, through practice, on the deciphering of my own 'Black Box’ of design thinking. Through taking permission and agency to try everything and actively parachute myself into a range of diverse practitioner roles Ive had an exhilarating R&D experience. I’ve been a hologram designer, spaceship navigator, sculptor, garment painter, builder, podcaster and factory archivist, all of which hold tangible potency to incite innovative approaches to menswear. These roles have bolstered my pursuit of a polymath approach spanning material synthesis, reinventing heritage and reimagining manufacturing systems. My professional experience is broad; I have freelanced for companies such as Stella McCartney (2017 and Petra Design (2016-2018). In late 2017 I was awarded the British Fashion Council MFA scholarship 2017/2018 after scrutiny from industry experts lead by Sarah Mower MBE, Vogue critic, ambassador for Emerging Talent at the British Fashion Council (BFC) and chair of the Newton committee and Judith Rosser-Davies, Head of Government Relations & Education at the BFC. 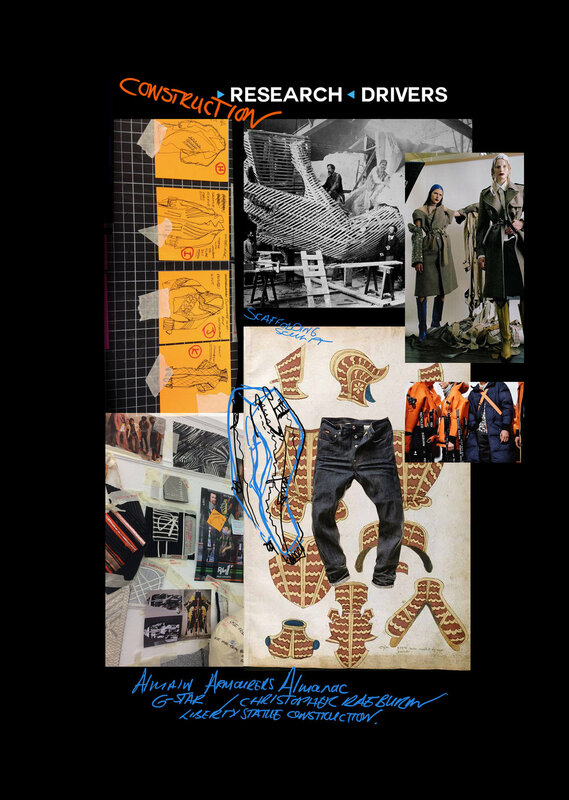 In late 2017 I was approached and commissioned to create an exhibition piece for the 30th anniversary of global denim manufacturer Calik Denim as one of 30 designers selected from around the world - I was the only designer form the United Kingdom. My work and I toured globally, from Istanbul to Amsterdam to L.A. which was a fantastic experience and well received. I also host and produce a podcast discussing design structure, order, improvisation and intuition. In addition, this summer I will also lead a workshop on sculptural and modular response to ergonomics of the body in Rwanda at invitation of the British Council. This will culminate in a collaborative commission with Rawandan designers and disabled contemporary performers, to be exhibited and performed at the East African Nights of Tolerance Festival in Autumn 2018. From September-December 2016 I completed a 3-month placement at Burberry in their Menswear Runway Design department as a result of winning the Burberry and British Fashion Council Competition built upon the use of 3d sculpt-cutting, 3D modeling, and experimenting & composing new exciting materials encompassing Carbon Fibre, Kevlar and Sophie Hallette lace that culminated in the success of my BA (Hons) graduate collection. The collection led me to be shortlist nominated for Scottish Graduate of the Year 2016 at the Scottish Fashion Awards and Best Emerging Designer at the Scottish Variety awards, as well as 2nd place in the Oracle Fashion Technology Award at Graduate Fashion Week for the resin chemistry and structural alteration of lace. In addition at Graduate Fashion week, Edinburgh placed 2nd in the Exhibition Stand Design which I had conceptualised, designed, manufactured and built in partnership with one other student. In my formative years of study I completed various other placements and freelance ranging from H&M with knitwear and denim in Sweden to outerwear and streetwear in New York for Rochambeau and Patrik Ervell positioning myself in the environments I judged beneficial for furthering my practice. I am also extremely grateful for the support though my MFA from 3 Edinburgh based scholarships - the Andrew Grant, Richard Brown and John Patterson scholarships.